A watch rated as Water Resistant may come in contact with water to a predetermined extent. Most watches are classified by the degree until which depth of immersion is safe. It is important to remember that a water resistant rating is based upon optimum conditions in a laboratory. Real life experience and aging of the gaskets will effectively decrease the manufacturer's specifications of water resistance over time. Water coming in contact with the movement is the worst scenario that can happen to a watch. Thus, we strongly suggest that you always work well within the parameters of the manufacturer's recommendations and have your watch tested at least once a year. Any competent watchmaker has the necessary equipment to test water resistance. Case Back: This refers to how the case back is attached to the watch. Snap-on case backs are sealed by pressure and are considered the least water resistant. The slightest nick in a case or deformity in a gasket (which will happen over time) will allow water to penetrate the case. Generally, these watches will have a water resistance of 30m/99ft maximum - which allows for contact with water but not immersion. Case-backs attached with screws would be the second level of water resistance. Having the case back attached with screws allows for a much tighter seal than a snap-on case back, however a deformity in the gasket will still allow water to penetrate. Generally, these watches will have a water resistance of 100m/330ft maximum - which allows for light swimming and immersion in a pool. Screw-in case backs are threaded and screwed into the actual case. This creates a double seal, using both the threading and the gasket as a seal. Generally, (although not as a rule) diving watches with water resistant ratings greater than 100m/330ft will have this type of case back. Crown: the single most important factor to ensuring water resistance. The weakest part of a watch for water to penetrate is the crown-stem hole. The stem of the crown is attached to the movement through a hole in the case edge. As the crown is constantly moved to different positions, wound and turned to correct the time, the gasket is constantly compressed, chafed and stressed. The slightest variation in the shape of the gasket or if the crown is not pushed all the way in will allow water to penetrate the watch through the stem hole. Screw-Down Crowns are threaded and screw shut to a matching threaded tube in the case. The crown has a gasket that is compressed and seals the opening when the crown is tightened - thus ensuring water resistance. A screw-down crown is an essential feature for any watch you intend on swimming with. We do not recommend swimming with a watch that does not have a screw-down crown. However, even if the watch has screw-down crown and chronograph pushers, the crown and pushers are never to be pushed, adjusted or opened when the watch is immersed in water - unless otherwise stated by the manufacturer. An additional benefit of the screw-down crown is that the crown is somewhat more protected from accidental knocks. Gaskets: Also known as "O" rings, are made of rubber, nylon or Teflon which form watertight seals at the joints where the crystal, case back and crown meet the watch case. If the watch is a chronograph, the chronograph pushers will also have gaskets. Gaskets begin to erode and break down over time, diminishing the water resistance of a watch. It is important to test your watch once a year for water resistance. Any competent watch maker should have the necessary basic equipment to test the watch - the cost involved should be minimal. Water temperatures in a hot-tub or a hot shower will effect the shape of the gasket seals. Especially if the watch is taken from hot temperatures and immediately plunged into cold water - such as going from a hot-tub into a pool. Sudden and rapid changes in pressure - such as diving (even shallow diving) into a pool, the force of plunging your arm into the water while swimming, will stress the gaskets for a fraction of a second. If the gaskets are not up to specification they may rupture and cause the watch to take in water. As the watch ages the seals begin to erode and will not maintain the same water resistance levels. Dry Test: The watch is placed in a chamber and the air-pressure is increased. The machine detects the smallest variation in the case size. If the case expands, even slightly, then the watch is not water resistant. Wet Test: the watch is placed in a chamber which is half filled with water and half air. Air pressure is increased while the watch is out of the water, then the watch is slowly immersed into the water. Once the watch is completely immersed, the air pressure is slowly released. If bubbles come out of the watch it means that air seeped into the watch prior to immersion AND the watch is not water resistant. This method is generally used as a second test to pin-point the problem area. The Helium Escape/Relief Valve is used only in extreme deep diving expeditions when a diver operates from a diving bell. As the bell is lowered pressure begins to increases and helium is added to the breathing mix. The helium is added to remove toxic air created by the extreme depth. Helium is one of the smallest molecules and will seep into the watch through the seals until the air pressure in the watch equals the air pressure in the diving bell. As the diving bell surfaces and decompresses, the helium needs to escape from the watch at the same speed as the decompression - otherwise the pressure in the watch will pop the crystal off. To avoid that, Omega developed the helium escape valve which allows the helium to escape faster than it seeps in. Many brands use the escape valve in one design or another. 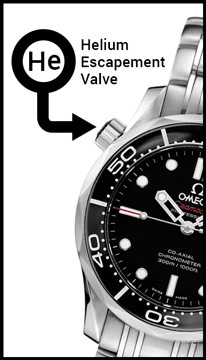 Generally, the escape valve can be found on watches which have a water resistance rating of 300m or greater. 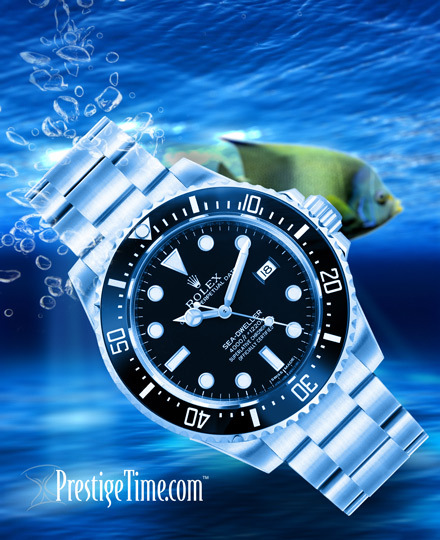 Although a watch may be rated 30m/99ft water resistant, it does NOT mean that the watch can be immersed to that depth. The depth rating posted by the manufacturer is theoretical in nature and can only be achieved in a perfectly optimum environment of a laboratory - which is impossible to replicate in real life. Have your watch water-tested once a year. Do not shower or swim with your watch unless it is rated 100m/330ft and has a screw-down crown. Never press the buttons of a chronograph watch while in water, unless otherwise stated by the manufacturer. Do not subject your watch to sudden and rapid air-pressure changes. Do not allow your watch to come in contact with corrosive chemicals, such as abrasive soaps and highly chlorinated water. Ensure that the crown is always pushed in, and if you have a screw-down crown, make sure it is always tightened. Double-check before immersing in water.